These are growing so well! 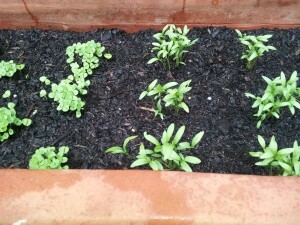 Planted some organic basil and coriander seeds. We use them a lot in our cooking so it makes sense to have them at hand ready to pluck fresh. It is all very well and good to grow herbs at home but please remember if you are going to grow your own herbs make sure that they are ‘Certified Organic’. I would like to highlight the word ‘Certified’ here as the word ‘Organic’ seems to be thrown around a lot. Being Certified means that they have been through the stringent process of having a series of periodic onsite inspections including soil testing ensuring that no toxic chemicals have been used such as: herbicides, fungicides, pesticides, insecticides, irridation or any other synthetic chemical. It also ensures that the produce is not GMO (Genetically Modified Organism). It does take numerous years of onsite inspections to ensure that the standard is definitely organic and only then will certification be given. When you purchase your herb seeds be sure to check the packet to make sure that it is certified organic by one of the above Accredited Organic Certifiers. Visit www.SelectOrganic.com.au for a great range of organic herbs. You can buy these from health food stores, organic grocers and food co-op shops. Also be sure to grow your herbs in a pot that is not plastic!!! So why is it important to use organic seeds and a pot that is not made from plastic? To reduce xeno-oestrogen exposure (foreign oestrogen that causes hormone imbalance). Synthetic chemicals sprayed on herbs and chemicals found in plastic are known as EDC’s (Endocrine Disrupting Chemicals). Endocrine means Hormone. So it isn’t always just Oestrogen that is impacted it causes hormone imbalance to other hormones in the body as well.